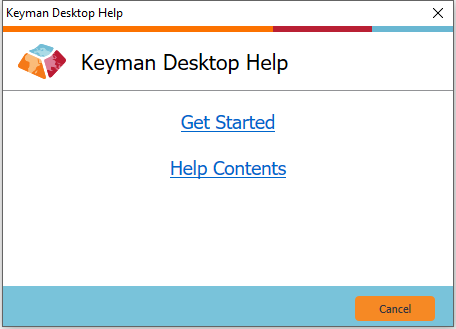 The Keyman Desktop Help menu gives you comprehensive help for every aspect of Keyman Desktop. All of the help available through the Keyman Desktop Help menu is also available online through the Help Documentation section of the Keyman Desktop help site. From the Keyman Desktop menu, select Help…. About Keyman Desktop — Provides general information and licensing details about the current version of Keyman Desktop. Getting Started — Includes all the help you need to start using Keyman Desktop quickly. Basic Help — Gives a detailed overview of all of the basic features of Keyman Desktop. Advanced Help — Gives an overview of more advanced Keyman Desktop features. Common Questions — Includes a selection of the most frequently asked questions. Troubleshooting Index — Provides reference guides for specific issues. Context Help — Links context-sensitive help (accesible throughout Keyman Desktop using F1) to the correct help topics.